Scholars continue to find a critical moment for the history of biology in Blumenbach and Kant’s intellectual relationship. Yet, the terms of that relationship remain contested. Did Blumenbach implement the methodological best practices suggested by Kant, arming a generation of life scientists with them in the process? Or did Blumenbach take Kant’s philosophical positions in name only, having already come to his own methodology long before reading Kant’s work? Foregoing interpretations that answer questions such as these have focused on the possibility of Kant’s influence on Blumenbach, while largely ignoring or denying the latter’s possible influence on the former. The purpose of this paper is to challenge this view by asserting that Kant did owe Blumenbach an intellectual debt, as Kant himself acknowledged in the only letter he ever sent to him in 1790. Analysis of the language and logic of §64 of the third Critique reveals that Blumenbach’s essay on the formative drive is an essential source for Kant’s preliminary definition of organized being. 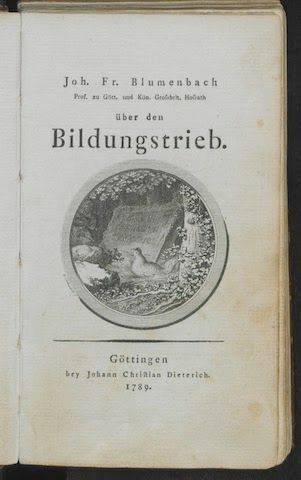 Moreover, Kant’s remark in his letter that Blumenbach provided a successful model for the unification of mechanical and teleological principles is not empty praise, but rather indication that the Bildungstrieb concept offered a true source of this unification―one that Kant utilized in his own work thereafter. Hence, Blumenbach was essential to Kant’s philosophy of the organic world, which reaffirms the indispensability of this intellectual relationship for any understanding of the epistemic foundations of biology. "What's an Organism among Friends: Reassessing Blumenbach and Kant’s Intellectual Relationship" was delivered at the History of Science Society's annual meeting on November 11, 2017 in Toronto, ON.